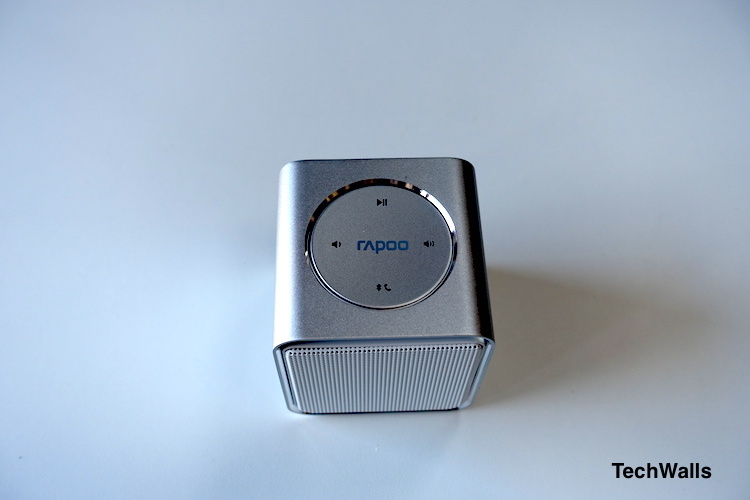 I’ve just reviewed the Rapoo A500 wireless speaker and was quite impressed with its premium build and features. Today, we are going to take a look at the smaller and cheaper version, the Rapoo A300. 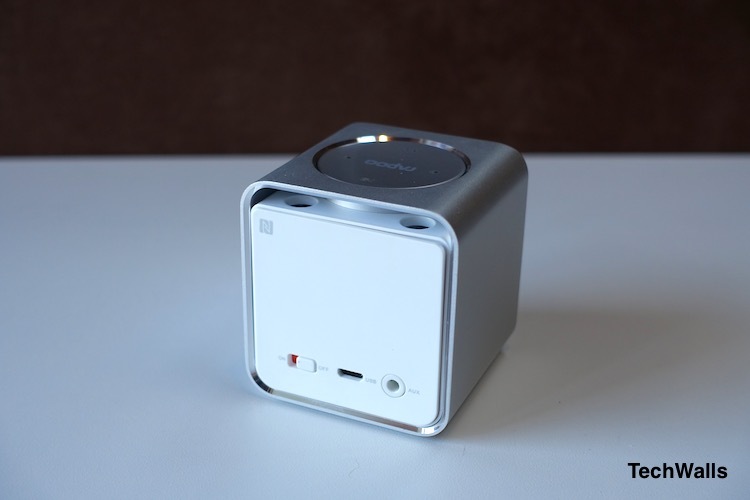 The Rapoo A300 has a shape of a cube and again I am so impressed with build quality of Rapoo’s products. The A300 is much smaller than its bigger brother but it still manages to keep a great design. 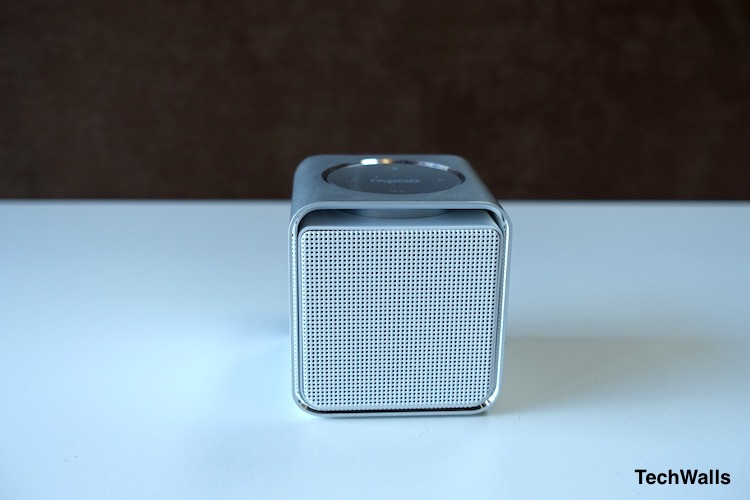 While the body of the speaker is made of plastic, it is covered in a beautiful aluminum case, and of course, this is a seamless design with no screw at all. The whole unit is so sturdy and feel like a premium product from Bose. Really the design and casing remind me of recent Bose’s Bluetooth speakers. All controls are placed inside a nice ring on top of the speaker while the power switch, mini-USB port and AUX cable are located on the back. In terms of features, the A300 features the latest Bluetooth 4.0 technology, NFC for simple pairing process and speakerphone to make hands-free phone calls. The battery can last up to 12 hours according to Rapoo but it could last just more than 8 hours in my test. The Rapoo A300 is so similar to Rapoo A500 with regard to sound quality. Again, we were so impressed with the design and build but the audio quality is not up to par, even when compared to some wireless speakers at this size. That doesn’t mean the Rapoo 300 sounds terrible, I actually prefer it over the Rapoo A500 because it features Radiation Airflow Invert Technology. The technology is not a gimmick as I can realize more bass responses and a louder, clearer sound. Unfortunately, there are still a lot of limitations due to the size of the A300, so you won’t be able to enjoy a full and detailed sound from the speaker. Check out a sound test below. Impressive design and build quality. The Rapoo A300 is available on some retailers for just over $30. This is a very nice little speaker that can upgrade the sound of your smartphone and laptop, it is not mind-blowing but it won’t hurt your wallet also.